1. Put the herbs, lemon zest, garlic and butter into a food processor and blend until smooth. Tip into a bowl, stir through the breadcrumbs and season with salt and black pepper. Place the mixture between two sheets of greaseproof paper and use a rolling pin to flatten to a large rectangle the thickness of a pound coin. Refrigerate for 20 minutes until firm but pliable. 2. Preheat the oven to 200°C, gas mark 6. Lay the herb crust on a large chopping board and remove the top sheet of greaseproof paper. Arrange the fish on top and cut around each piece. Flip the fish over and remove the greaseproof paper from the crust. 3. Transfer the fish to a baking tray lined with greaseproof paper, then bake in the oven for 15-20 minutes until the fish is cooked through. 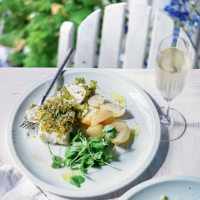 Serve with new potatoes and a watercress salad.